So I’ve been too sick to read. Unbelievable, right? Well, actually, sometimes when I get migraines I can’t actually see, so that’s why I couldn’t read. Really throws my everything out of whack. However, I managed to watch two movies the other morning. Not saying I didn’t miss some action happening in the bottom right quadrant, but I think we got the idea. It is true, I only do writing-related movie and TV reviews for you here. So I will not share all my happy adventures with Anthony Bourdain or Iron Chef, or even the creepy goodness that is Les revenants. Instead, we’ve got two not-so-new fiction movies about real writers, which just came up on Amazon Prime and that I had been meaning to see for a long time. 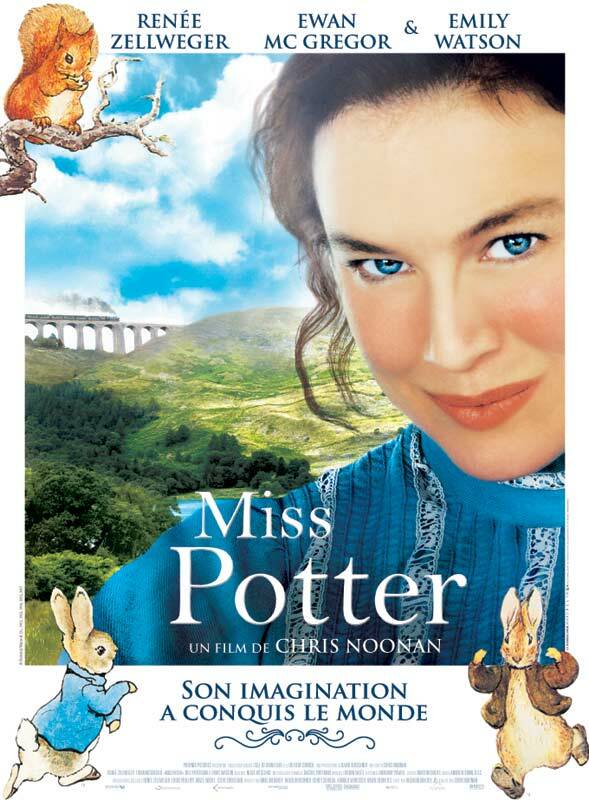 Miss Potter. 2006, directed by Chris Noonan and starring Renee Zellweger and Ewan McGregor. Obviously, the movie is about Beatrix Potter, one of the best-selling children’s book authors of all time, and about her career and love life (or lack thereof). As a just plain movie, I thought it was decent. It was missing some charm that would call me back to watch it again, but it was pretty solid. At times, it got slow, but just barely. The acting was wonderful: the heroine was kinda weird and the hero was awkward and that’s as it should have been. The scenery was lovely. The story was so interesting partly because it was true. You feel so deeply for poor Miss Potter. As a writing movie, it was both good and a little bit bad. I judge writing movies largely on the realistic or unrealistic portrayal of the writing life (and what it can contribute or say). I applaud showing just how long and hard Potter had to cling to her dream before anything happened. I thought it was funny that she was surprised, over and over, with fame and fortune when it did arrive. But the way she ends up is extremely abnormal. Of course, we wouldn’t be making a movie about Potter if she had only scraped by, would we? My issue is not with one or two movies with the same fantastical theme, it’s all of them. I guess it’s like romances? They hardly ever happen in real life that way, but people love to dream about them. Take it with a grain of salt, then, writers! Writing movies are about famous writers. There are a thousand talented and determined writers for every story like that. Or more. But overall, the story was encouraging. In the movie, at least, Potter was such a strong-willed, courageous, and principled person. After all her hard work, she practically fell into fame (although I hear that her publishing story was a little more complicated than the movie’s plot) and right into a very unexpected romance. From there, you’ll have to see the movie, but it’s a tear-jerker, all right? Potter is a great example of someone who was an artist, a storyteller, to her very core, and she was determined to be a successful author, even though she was unmarried, even though she was a woman, even though she was upper class. And boy did it ever pay off. The scene that really ripped out my writer’s heart was when her dad brought home a copy of her latest book. Seriously. You’ll have to see it, but it really captures the need writer’s feel to be respected for the work they do. And for that respect to come from those closest to them. Of course, many writers never receive that (and I don’t think Potter every really received it from her mother), but at any rate, it’s a very moving scene. For writers. Finding Neverland. 2004, directed by Marc Forster and starring Johnny Depp and Kate Winslet. And this one is about J. M. Barrie, the author of Peter Pan, who strikes me as much more of the usual playwright/writer kind of fellow, with his work spotty and his personal life a mess and all that nonsense. And perhaps nonsense is a good word for my review of this movie. It was nonsense. The idea was good, real good, but the execution was nonsense. Let me explain. I love the idea of introducing magic into a realism movie (it’s called magic realism) and this movie is a perfect venue because you have a man who is being re-drawn into his own stunted childhood through the childhoods of others and in the meantime he ends up creating one of the most timeless pieces of fantastical literature of all time. Perfect, right? Not in execution. First off, the magic bits were awkward and too sparse. Nuff said. Second, the moral of the movie was “Just believe.” Like, at the end, we have a man and a boy dressed in black and the man is telling the boy with all the gravity and wisdom of his life: “Just believe.” Don’t. Make. Me. Barf. He just said his mom died! This is the most tired, most ridiculous theme in American film and literature, and it is extremely prevalent. That does not make me like it more. Third, it’s too slow. I don’t know when two hour movies became the norm, but most movies feel best at an hour and a half. This is one of them. Fourth, I don’t like broken marriages. You’re supposed to be all like, “Oh, well poor Johnny Depp is having a cold bit with his wife and she doesn’t really understand him, so it’s cool if he just wanders off everyday to hang out with a few boys and their lovely, widowed mother.” Uh-uh. That does not make a successful love story for me, at all. In fact, I had the distinct feeling at the end of the movie that I could not count on Barrie to raise those boys consistently. Why? Cuz clearly he sucked at commitment. I think this movie could have been an interesting movie about a playwright coming into his own, about an imperfect man showing a glimpse into the creative mind that started it all. I think the story about his foundering career, his failing marriage, and his relationship with the fated Davies could have been a part of that story. But I don’t think making him the bumbling hero was the answer, or even making her the north star of an awakening. And I think we belonged more in Neverland. On the other hand, it’s always fun to watch a movie about someone’s writing process. The more journals on screen, the better! J. M. Barrie seems so mortal in this film. Neverland seems to come from a real life. And people thought he was nuts. Of course, the best part of the film was when he brought in orphans to see the play’s opening. While predictable, it forced new thinking on the social elite and caused them to actually enjoy their basic entertainment. It underlines that artists and writers need to be fore-thinkers, pushing the boundaries and testing the limits, being bold and innovative and exciting. Barrie didn’t just write a great play, he invited people outside of the proper socioeconomic class and age group in order to enhance the experience. He had vision, which can make all the difference. In other words, I would recommend Miss Potter for a quiet, rainy afternoon with a hot tea and a box of tissues. 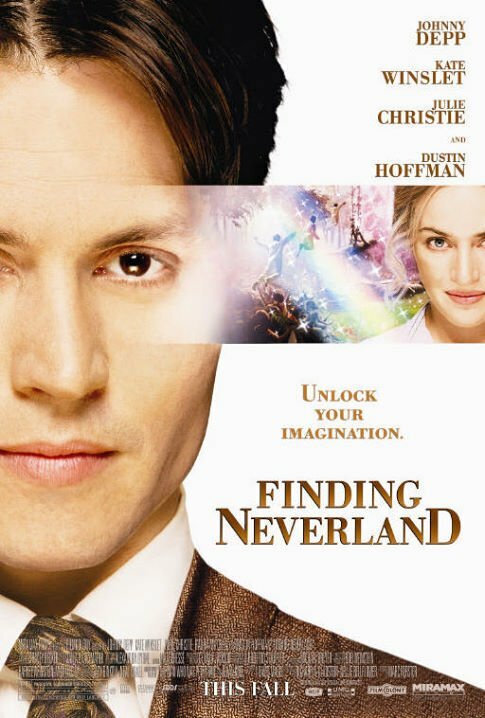 I would not–despite the other reviews–recommend Finding Neverland. You’ll be sad to see such great acting wasted on fluff. Or you won’t. No saying you have to listen to me.